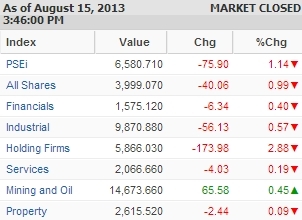 Manila—(PHStocks)—Philippine stocks falter on a new wave of profit taking Thursday, 15 August, after a rally yesterday. The benchmark Philippine Stock Exchange index (PSEi) slid by 1.14% or 75.9 points to close today’s trading at 6,580.71. Contrary to yesterday’s market performance, the Mining and Oil index was the only sector to post gains (+0.45%). All the remaining counters were back in the red, led by the Holding Firms segment, which declined by 2.88%. The Industrial sector slid by 0.57%, while the Financials dropped by 0.4%. The wider All Shares index was down by almost 1%. Trading continued to be moderate. Value turnover was PhP7 billion on 909 million shares traded. There were 70 gainers against 84 losers, while 46 stocks were flat. Today’s gainers include SM Investments Corporation (SM, PhP805.50, -7.73%), Ayala Land Inc. (ALI, PhP30.70, +0.82%), Philippine Long Distance Telephone Co. (TEL, PhP3,070.00, NC), Universal Robina Corporation (URC, PhP121.10, -2.34%), Alliance Global Group Inc. (AGI, PhP28.20, +0.36%), Ayala Corp. (AC, PhP598.50, -0.08%), SM Prime Holdings Inc. (SMPH, PhP17.92.00, -2.29%), Suntrust Home Developers Inc. (SUN, PhP1.27, +49.41%), BDO Unibank Inc. (BDO, PhP82.00, -1.20%), and GT Capital Holdings Inc. (GTCAP, PhP868.00, -0.29%).